Who is the Conlanging Librarian? Well, for starters check out the artwork (created by my daughter) to the left. 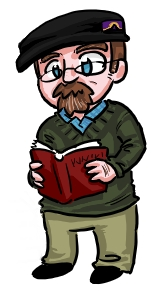 That's me in chibi (or super deformed) style. Note the conlang flag pin on my hat! You can also see me in the photo to the right, in the second row (i.e., the front ones standing), third from the left, standing between John Quijada (creator of Ithkuil) and Jeff Burke (creator of Proto-Central-Mountain). What an honor! That photo was taken at the 2nd Language Creation Conference (LCC2) at UC Berkeley. LCC2 also provided me with the opportunity to meet David J. Peterson (kneeling in the front on left), a conlanger's conlanger, and Sai (holding the conlang flag in the back row), founder and President of the LCS...both of whom I have inordinate respect for. One of the other participants at LCC2 was Arika Okrent (back row, first on the left) who is peaking out from behind the head of Doug Ball.You may recognize her as the author of In the Land of Invented Languages. One of the most amazing things to come out of LCC2 was the fact that Jeff Burke, yours truly, and several other participants got mentioned in Arika's book. The personal connection notwithstanding, In the Land of Invented Languages is an excellent overview of the art of language creation and is highly recommended. Another pivotal conlanging moment for me was the opportunity to create the Esperanto, Elvish, and Beyond exhibit at Cleveland Public Library. I am also a member of the LCS Board of Directors and designated "Librarian". And, for those (here would be a good place for an English dual demonstrative) who are wondering: yes, the Conlanging Librarian is a card-carrying MLS librarian.